The Community Association of the Highlands is located in the heart of Sugar Land spanning from Highway 6 and Lexington to Settlers Way and then along Williams Trace. It was one of the first neighborhoods built in First Colony starting in 1978. To maintain the neighborhood’s appeal for the residents, the Highlands has been busy in the past year with several capital improvements and Board initiatives. This spring, the Highlands Community Association refurbished the entrance flower beds by adding rock and new plants to enhance and update the entrances. Since the neighborhood is located on major thoroughfares that thousands of people travel on daily, this improvement is enjoyed by many more than just the residents. The main capital project started a few years ago, when the Board realized that the pool house at Pool #1 was in need of major repairs. They began to plan for a facility that would replace the existing structure which had only pool restrooms, a guardroom, and storage with a Community Center that would include these amenities and so many more. The new center has a multipurpose room that Highlands residents can rent for private functions complete with restrooms and a warming kitchen and a room that the Board can use for their meetings. To accommodate for the enlarged footprint of the Community Center, the renovation project included playground relocation, expansion of the parking lot and new tennis courts. The neighborhood is proud to have such a beautiful facility for the residents. Two of the primary Board initiatives this year were to increase communications and participation in the community. The Board strives to constantly update the residents through a variety of mediums. They have a quarterly newsletter, website and even a new bulletin board at the pool. They have hosted a variety of events including two garage sales, Hockey with the Aeros and the largest National Night Out party in Beat 4, Sugar Land. These are quite remarkable feats considering that, in February, there was only one member left on the Board of five. 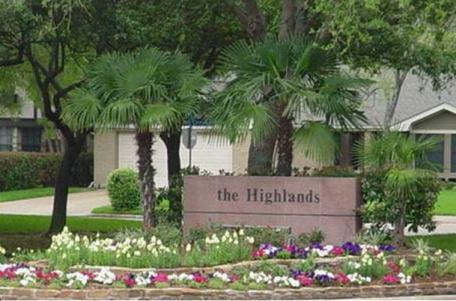 The Highlands is a wonderful community right in the heart of Sugar Land that strives to maintain the “high” standards that the residents are used to!